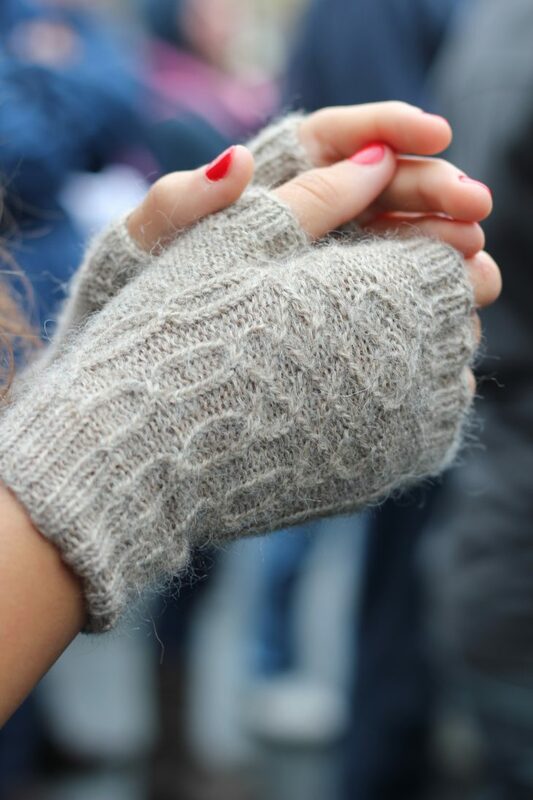 The mitts are knitted in the round from bottom cuff to fingers. The pattern includes full written instructions (including line-by-line instructions for the cable pattern) and a chart. Choose needles for your preferred methods of small diameter circular knitting. Due to the nature of the design, sizing is based on tension/gauge. Needles listed are a recommendation only; you will need to swatch to choose appropriate needles for the size you wish to knit. The pattern is available in both A4 and Letter size formats, and all instructions include both US and UK knitting terminology. Baht ‘At is also available in ‘Born & Bred’ (see ‘Books’). I knit this sample for Ann, along with the matching beret. The design is beautiful incorporating Bavarian twisted stitch cables which I love to knit. The pattern is of course well written, and the finished gloves are lovely. I’ve since knit a set for myself – http://www.ravelry.com/projects/Wychwoodlady/ilkley-moor-2 in my favourite blue!